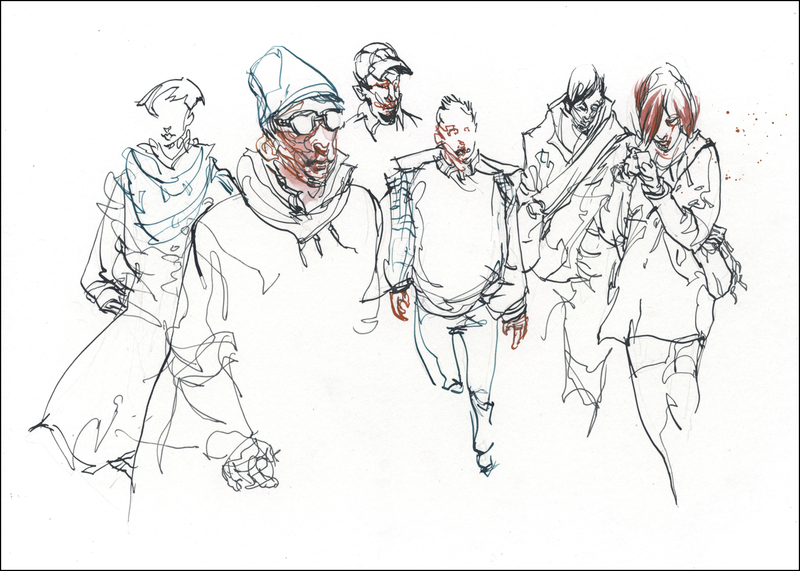 I thought I’d do a few posts excerpting sections from my book The Urban Sketcher. I’ll be resurrecting some stuff that was cut due to space limitations, and taking the opportunity to show larger images than we can get away with in print. 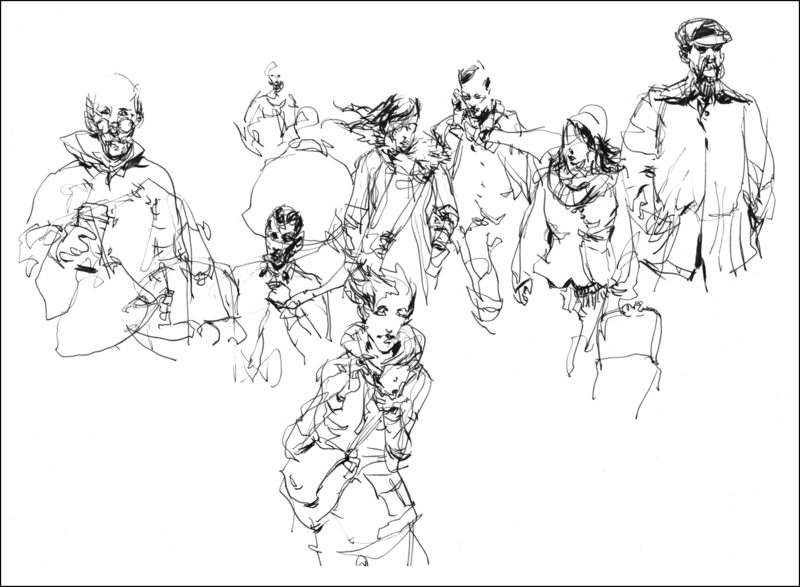 Exercise #9: Sketching En Passant: or The Long View: So the final situation to discuss is the capturing of people who are truly in motion. Not conveniently doing something for your amusement, but only seen for a few moments as they flow through your drawing. I call it ‘en passant’, the chess term for ‘capturing in passing’. In the normal case of a person walking towards you, even in the best situation where you have an unobstructed view, you have only the time between spotting your approaching subject and about 20 or 30 feet before they pass you by. It’s very rare that you have a longer sight line than this. People in the extreme distance are just too small, and are frequently blocked by the crowd in front. So we can say you have a 10-15 second window to sketch. I would agree, that is not a lot of time. But! Of course, I have a strategy for this situation. There are two things you can do to help yourself out. The first, and most basic, is to widen the window of opportunity. Try and find a position that gives you the longest possible view of the most people. You want to be a small island in a river of people, with a long straight, preferably up or down hill view. (A steep angle allows seeing over people’s heads. They don’t obscure each other as much). To avoid being jostled by pedestrian traffic, I’ll lean with my back against a wall or a lamp post, so I’m only a little bigger than an obstacle they’d have to avoid anyway. If you can get up somewhere, a balcony or bridge, you can benefit from the bird’s eye view. Other possibilities are the head of a long escalator, (trapping people for a few moments gliding up to you). Or across from the exit to a stadium or theater when a big show is letting out. If nothing else presents itself, you can use any major downtown intersection during rush hour. 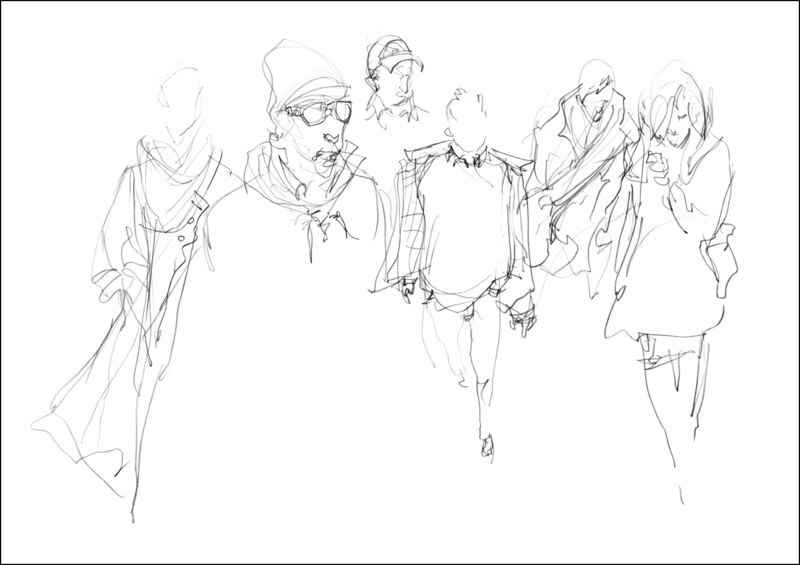 Scribble people waiting for the crosswalk as they stream out of the office buildings. The further you can see, and the more populated the street, the more fuel you will have for your fire. You want the best possible view for the longest possible time. (Even if that’s not very long). In these examples, I scribbled in pencil and did calligraphic line over top using three colors of ink and a dipping nib. 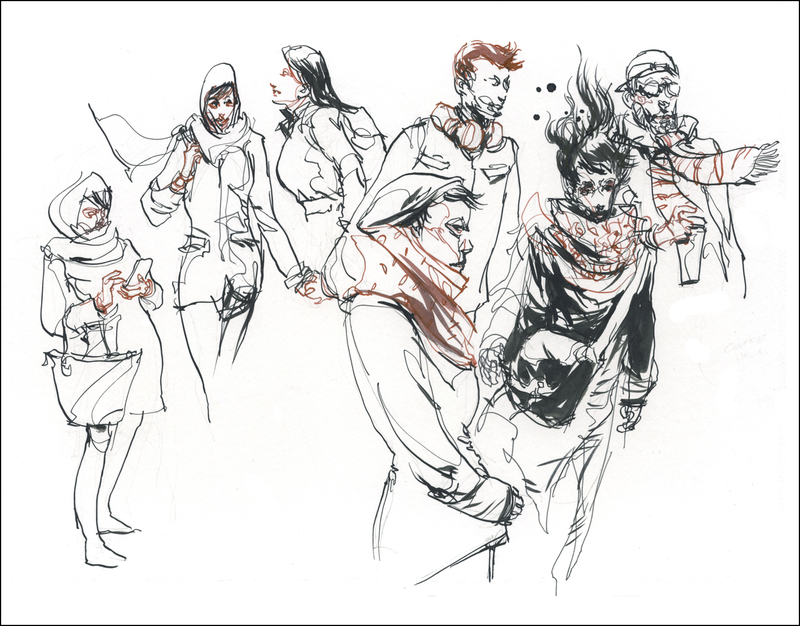 It was a cold windy October day, so I had plenty of interesting scarves, hats and jackets to sketch. The best character was a person wearing a neon orange plastic rain poncho and dragging a pair of bulging black garbage bags. This is a classic example of something you couldn’t make up. The second thing you can do to increase your time window, is to cheat. Don’t restrict yourself to one ‘exposure’. 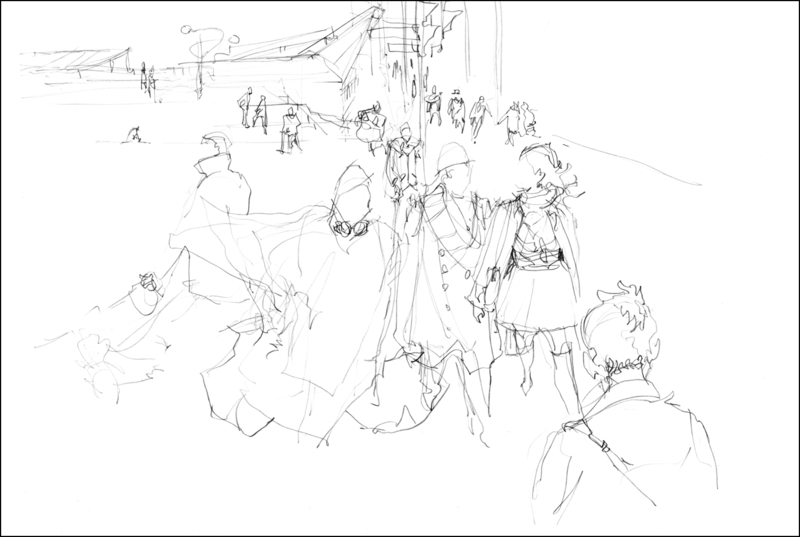 Instead of trying to draw an entire person in that 20 second window, I create a composite figure, combining multiple passersby, as if they were key frames of a single character in motion. In a given crowd of people there are always ‘types’. People dress according to fashion trends, their jobs and economic standing, and the local weather. In a street market in Asia there will be a never ending selection of wiry guys in t-shirts, shorts, and flip flops, often carrying heavy loads on their backs. On a blustery day in Montreal, everyone has long scarves, layered jackets, and wool caps. You can choose a ‘type’ – such as the smartly dressed man walking his dogs – and if you’ve chosen well, you’ll get another matching type in short order. In this area of expensive condos, it didn’t take long to get another dog walker. 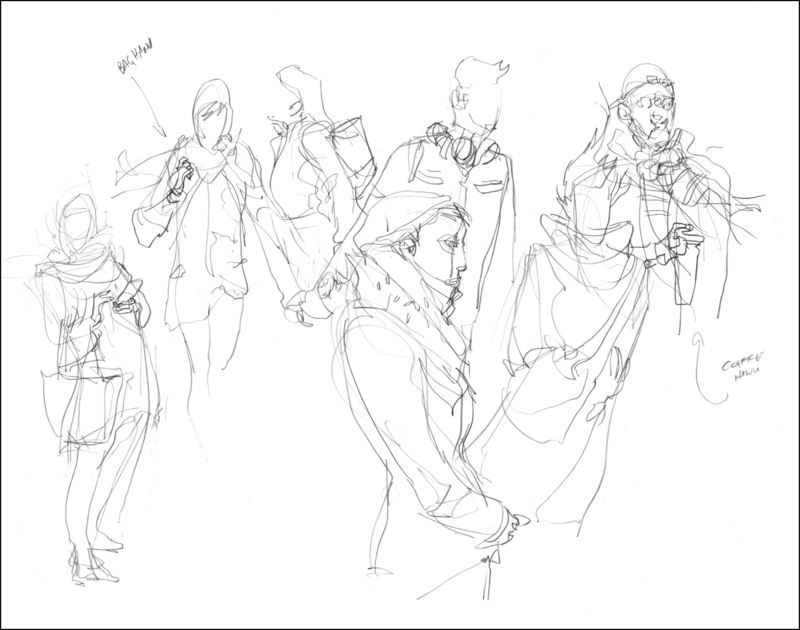 Just as with the key frames of repeating motions, I can combine these passing ‘twins’ into a single drawing. Try and spot your character types as far back as possible, and keep your eye on them. Don’t get distracted by anyone else until they get so close they’re about to stride out of your working zone. If I can gather one detail from each person – the shape of a hairstyle, a pair of glasses, the clasps on a bag – fairly quickly I have an entire composite figure. The gesture is the framework I am looking to fill in. I am adding appropriate details on top of the gesture, so it hangs together as a convincing person. The character types that are more common are by definition best descriptions of the time and place you are in. Whatever you are seeing a lot of, is what will get drawn. Try to get four or five character types going at once and you can do the multi-tasking trick while you wait for clones to appear. This is an excellent time to try skipping pencil and going straight to ink – if you dare! Speed is of the essence here, so perhaps this is the best time to save a step. En passant is a great way to become more comfortable sketching without the safety net of pencil. You end up drawing so many people so quickly this way, it’s possible to get a tremendous amount of training in a single day. A year’s worth of life drawing classes in a week. A serious student might set aside a small sketchbook, and try to fill the entire book with direct-to-ink en passant sketches. Can you devour your way through an entire book in a week? Or a month? If you can do it, without editing yourself, or concerning yourself with ‘quality’ – simply devoting yourself to the process, I am sure you will see tremendous results. Here’s an example where I went directly to ink. 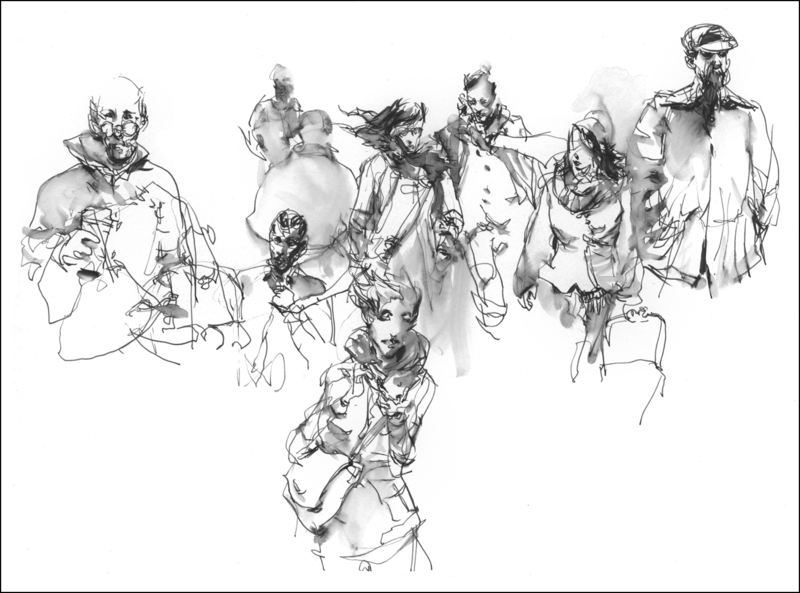 I’m using all the ideas we’ve covered, drawing Outside in, gesture followed by Calligraphy, and Spot Blacks. Doing it all in one continuous process. With these ones I’m using the Lamy Safari Fountain Pen and a Kuretake Sumi Brush Pen , then melting the water soluble ink with a little clean water. I normally prefer the more aggressive line weight of a dip pen, and the more expressive range of a natural brush – but when you are doing it as fast as humanly possible, these kind of cartridge fed fountain pens are more practical. The chance of an ink spill goes up considerably when you’re in a rush. 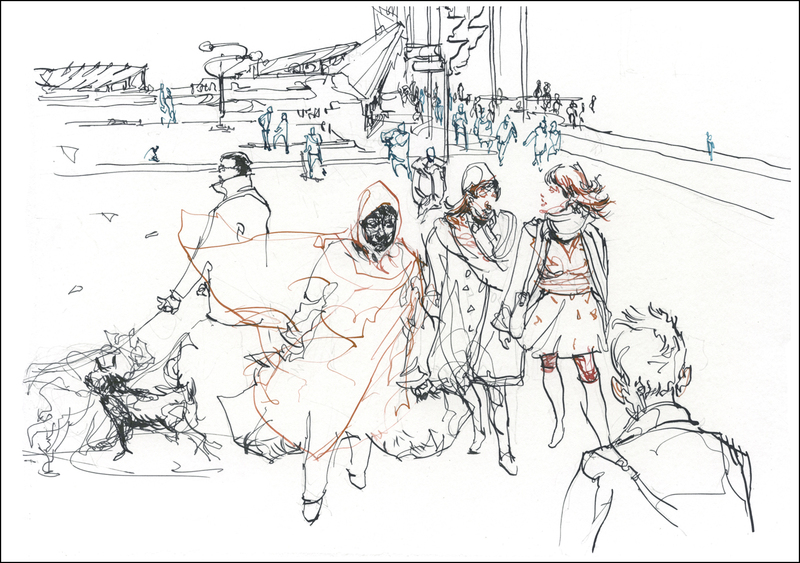 [Excerpt from The Urban Sketcher Ends – thanks and hope you like the book! Order now from Amazon or your local bookshop]. Thank you for a really interesting article. I have never drawn strangers in the street but would love to give it a try some time. Thanks for the guidance. Your drawings are so energetic. I am inspired. Dive in! It’s great fun :) It makes riding the subway a lot more rewarding. I just need time and opportunity now. Perhaps next time I go somewhere busy, I will take a sketchbook. Thanks for the encouragement. Wow…thanks for doing this, Marc. marc, i own one of your books and would appreciate if you could enlighten me? In drawing a group of people, how do you decide which person to focus in using your method of spot black colours.